FilmArray Pneumonia/Pneumoniaplus Control is intended for use as an external positive and negative assayed quality control to monitor the performance of in vitro laboratory nucleic acid testing procedures for the qualitative detection of bacteria: Acinetobacter calcoaceticus-baumannii complex, Enterobacter cloacae complex, Escherichia coli, Haemophilus influenzae, Klebsiella aerogenes, Klebsiella oxytoca, Klebsiella pneumoniae group, Moraxella catarrhalis, Proteus spp., Pseudomonas aeruginosa, Serratia marcescens, Staphylococcus aureus, Streptococcus agalactiae, Streptococcus pneumoniae, Streptococcus pyogenes, Chlamydia pneumoniae, Legionella pneumophila, Mycoplasma pneumoniae; antimicrobial resistance genes: CTX-M, IMP, KPC, mecA/C and MREJ, NDM, OXA-48 like, VIM; and viruses: Adenovirus, Coronavirus, Human Metapneumovirus, Human Rhinovirus/Enterovirus, Influenza A, Influenza B, Middle East Respiratory Syndrome Coronavirus (MERS-CoV), Parainfluenza Virus and Respiratory Syncytial Virus on the FilmArray® Pneumonia Panel or FilmArray® Pneumonia Panel plus assay performed on the FilmArray® 2.0, or FilmArray® Torch systems. 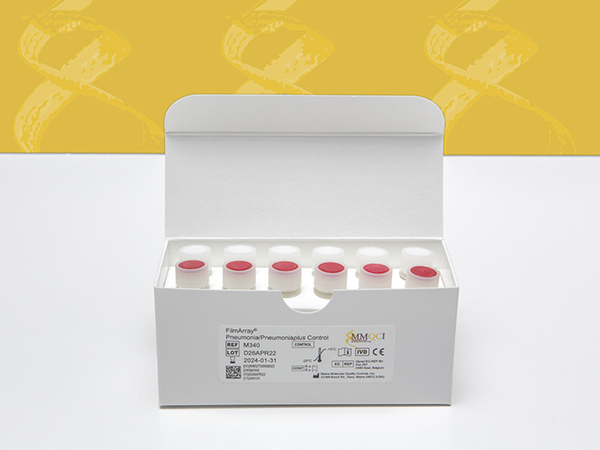 FilmArray Pneumonia/Pneumoniaplus Control is composed of synthetic RNA and DNA specifically designed for and intended to be used solely with the FilmArray® Pneumonia Panel and FilmArray® Pneumonia Panel plus assays. This product is not intended to replace manufacturer controls provided with the device.